We are in the final week of this study and the final gospel. These first chapters talk much about Baptism and of the four gospels give the clearest reasons for being baptised, in the story of Nicodemus. As you grow in your relationship with Christ you may be encouraged by friends, or nudged by the Holy Spirit to consider Baptism. It may be that as an adult this is not something you have considered, perhaps you were christened (baptised) as a baby and confirmed as a child. Why would you need to be baptised as an adult? I recently attended an adult baptism and I was moved by Pam's testimony and reasoning behind wanting to be baptised. Here she tells her own story. I was brought up in the Anglican Church in Wales, I was baptised as a baby and later received confirmation. I have attended church most of my life, but it was a visit to a Pentecostal church in my late teens that opened my life to the knowledge of Jesus as a personal saviour. My Christian journey has been going on ever since. I can’t say I had a ‘Damascus’ moment like Paul - more a gradual journey, slowly learning and getting to know Jesus, with a power that still humbles me. I do know he has never let me down albeit I have let him down regularly. I will not go into details about the mistakes I made suffice to say he has been with me in situations I shouldn't have been in as well as thankfully those I should. His forgiveness is overwhelming, his support and guidance gives me strength when I need it. Even through the hardest times I can look back and see that God showed his love and concern for me, he has provided me with help and fellowship through his word, my family and through the ministry in his church. When I had a meeting about becoming a member of my local church we discussed my Christian life and personal faith. I was asked about baptism, and my response at that time was that I didn't feel God was asking me to undertake this act. I had already received baptism as a child and confirmed as a teenager, but I can remember saying I believed in never saying never! Well lately it seems God has started nudging me in that direction, every time baptism has been mentioned I have felt uncomfortable, something saying to me is this for you? But I argued in my head "why?" For years I said the Nicene Creed in services, "I acknowledge one baptism for the remission on sins", so why do I need further baptism? John said I baptise you with water but he who comes after me will baptise you with the Holy Spirit – I know I have been given God’s gift of the Holy Spirit and have been so blessed with the fruits this has given me, so why do I need baptism with water? I’d been praying about this and spoken to people I knew who could support me. Was I wrong in assuming God was asking me to get baptised? Or was I wrong in the arguments I was using against it? I then realised there was really only one person I needed to ask and so I prayed to him to show me the way forward. His answer was clear, in John 3 verse 5 Jesus is talking to Nicodemus and says "Very truly I tell you no-one can enter the Kingdom of God unless they are born of water and the Spirit". Nicky Gumble’s commentary in the Alpha Bible I was reading said, "The outward washing is accompanied by the inward dwelling of the Holy Spirit." In Acts 10:44-48, Peter is speaking about the Gentiles after they have received the Holy Spirit “Can anyone keep these people from being baptised with water? They have received the Holy Spirit just as we have, so he ordered that they be baptised in the name of Jesus Christ". I was reading UCB Word for Today and it was describing faith as being like electricity "you don’t have to analyse or understand it to enjoy its benefits just plug in. What has God told you to do? Obey Him! Stop vacillating, stop procrastinating, stop arguing with him and do what he tells you. You’ll love the results. So here I am ready to love the results and continue with my Christian Journey. Pam's questions and journey are so familiar to many people who wonder why they need to receive baptism as an adult. The Church of England says confirmation is about becoming a member of the worldwide Christian family, many confirmations take place at an age where complete understanding of the commitment to faith may not be heartfelt. I was baptised as an adult, even though I had been baptised as a baby because I wanted to make an outward declaration of my faith. Now I'm more mature in my faith, I think I should have waited longer to have gained a much better understanding of my faith as a relationship. The Bible however says believe and be baptised and that is exactly what I did. 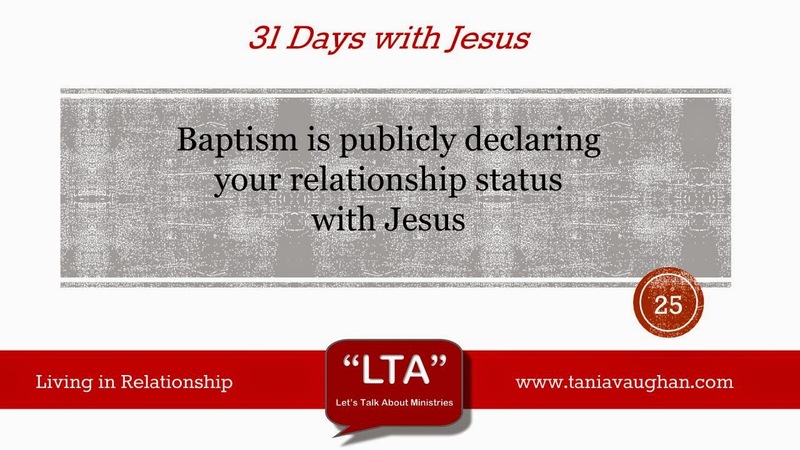 Baptism is a huge subject, too much for a one day devotion. Jesus encourages Nicodemus to be baptised of water and Spirit and I believe as we continue in relationship with Jesus he says the same today. If you have not made your own decision as an adult to be baptised then I would encourage you to speak to your pastor, if appropriate or please do contact me. For those already baptised I hope that Pam's story will help you as you speak to others. Lord, thank you for Pam's story and the honesty she shares in her questioning, it is a challenge as I think about my own journey. Thank you for your revelation to her in giving her understanding of the meaning behind baptism. If this is a step you want me to take Lord, please make it clear to me and direct my steps. I was baptised at university in the local church where most of the the Christian Union attended. My friends and family were there; it was all very nice! But was I ready? The question is somewhat irrelevant - Jesus says "believe and be baptised". He doesn't say 'make a commitment, wait a while, browse other options, make a mess of life and be baptised'. So the answer to my own question is yes I was ready! Of course, I could have waited til I was more mature and better understood the meaning behind it - but is that not part of my own personal journey? Baptism for me is two things. 1) public declaration of faith - 'I was like this but I'm born again and now like this'! It also serves to keep you accountable to your peers 'but aren't you a Christian..?' 2) you invite the Holy Spirit to enter into your life. Remember the spirit is what JC left behind after he was cruxified - its not called the trinity for nothing! If you believe and are considering baptism maybe you think you're not ready - maybe think of baptism as the start of your journey and not soemthing you do along the way.